This site holds a digital list of all links available within my book “Open Source Intelligence Methods and Tools: A Practical Guide to Online Intelligence” Published by Apress 2018. In this page, you will find a short description about the book in addition to its “Table Of Contents”. This is a practical book about OSINT, it describes in detail how to use different tools and techniques to harvest data from OSINT sources in addition to a dedicated chapter for online privacy and anonymity. or from your preferred bookseller! Many estimates show that 90% of useful information acquired by intelligence services comes from public sources (OSINT). Social media sites open numerous opportunities for any investigation because of the vast amount of useful information that can be found in one place. For example, you can get a great deal of personal information about any person worldwide by just checking this person Facebook page. This book will show you how to conduct advanced social media investigations to access content believed to be private, use advanced search engines queries to return accurate results, search historical deleted versions of websites, track individuals online using public record databases and effective people searching tools, locate information buried in the deep web, access and navigate the Dark Web; and be able to collect intelligence from the Dark Web, view multiple historic satellite images and street views of any location, search geo-location information within popular social media sites and many more. The reader will learn practically how to use a plethora of techniques, tools and free online services to gather intelligence about any target online. OSINT gathering activities should conduct secretly to avoid revealing searcher identity, this book will teach you how to conceal your digital identity and become anonymous online, you will learn how to exchange data secretly across hostile environments like the internet and how to communicate with your peers privately and anonymously, you will also learn how to check your digital footprint and discover what kind of digital traces you are leaving behind and how to delete them. This book is an indispensable guide for anyone responsible for the collection of online contents from public data and private repositories. 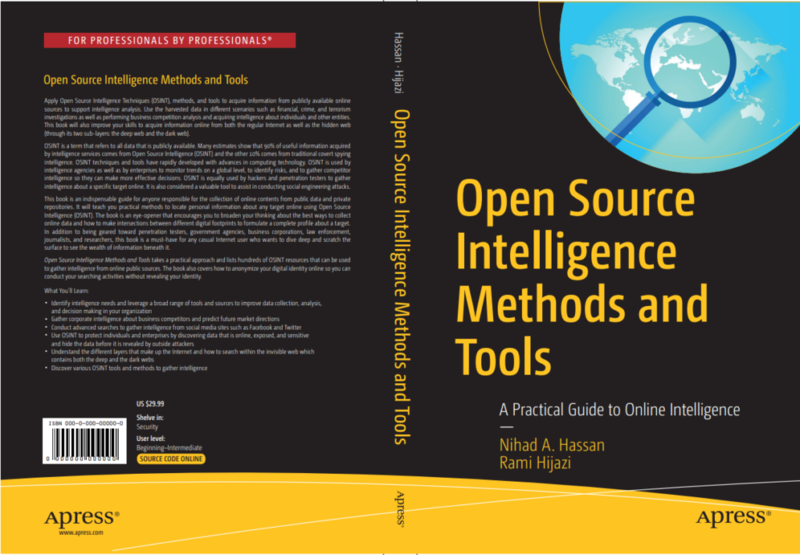 It will teach you practical methods to locate personal information about any target online using Open Source Intelligence (OSINT). The book is an eye-opener that encourages you to broaden your thinking about the best ways to collect online data and how to make intersections between different digital footprints to formulate a complete profile about a target. In addition to being geared toward penetration testers, government agencies, business corporations, law enforcement, journalists, and researchers, this book is a must-have for any casual Internet user who wants to dive deep and scratch the surface to see the wealth of information beneath it. End users want to learn how to exploit Internet resources effectively. Chapter 1, “The Evolution of Open Source Intelligence (OSINT)”: Introduce the reader to the term OSINT and how it evolved over time to the current date. We introduce different parties interested to exploit publicly available data and the benefits gained from this issue. Some technical information about online gathering techniques also introduced, expected challenges when doing this, in addition to the legal aspects when harvesting data from publicly available sources will also get covered in this chapter. Chapter 2, “Setting the Stage”: This chapter teaches readers everything they need to know to stay safe when going online. This knowledge is essential when conducting advanced search online to avoid being tracked back, as using advanced search operators and other OSINT search techniques will grasp attention online and make your connection a target for interception by different outside parties. Chapter 3, “The Underground Internet”: This chapter is devoted to uncovering the secret of invisible web which contains both the darknet and the deep web. This knowledge is essential as the underground net contains a wealth of valuable information that any cybersecurity professional should know how to access it. Chapter 4, “Search Engine techniques”: In this chapter, we will show you how to use advanced search techniques using typical search engines like Google and Bing to find anything online. Other specialized search engines like images, video, news, web directories, files and FTP are also covered. Chapter 5, “Social Media Intelligence”: In this chapter, we will show you how to use a wide array of tools and techniques to gather intelligence about a specific person or entity from social media sites. For instance, Facebook is considered the most appealing site which allows different parties to gather intelligence about people worldwide. Other major giant tech companies like Google and Microsoft also own a huge database of information about their users. A great amount of information is published publicly on these sites and this chapter will teach you how to search for people, their relationships,names, addresses, location and their communications -and interactions- with others on social sites to formulate a complete profile about your target. Chapter 6, “People Search Engines & Public Records”: Here we list specific search engines and other public resources to search for people names and get details around them. We can use different reverse search criteria to find people online like: Birth records, mail address, resume & dating websites, emails, phone numbers, previous breached usernames and many more. Government resources like Vital records, tax records, criminal info and other public sources will also get covered in this chapter to gain intelligence about people/entities. Chapter 7, “Online Map”: Using Google Map and other free geo-lolocation services to investigate the Geo-location information acquired from target people. Chapter 8, “Technical Footprinting”: Gathering technical information about a target website and network system in passive mode to support our OSINT intelligence.